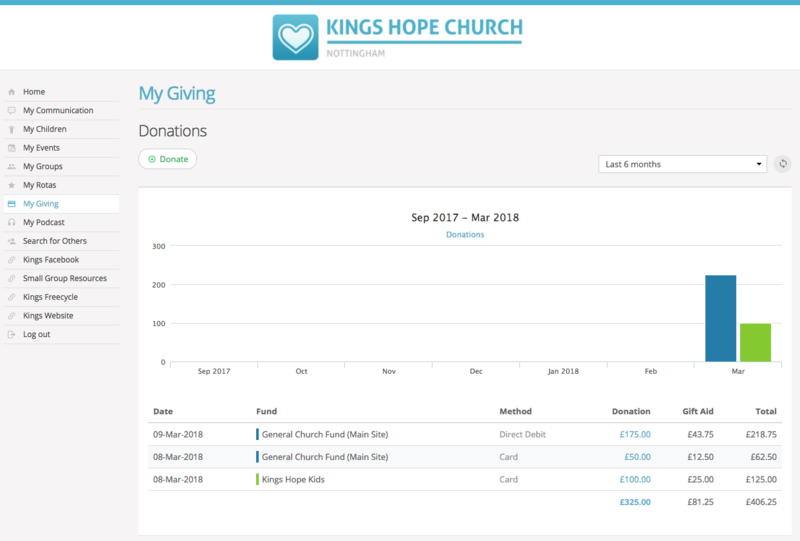 The My Giving section of My ChurchSuite enables your church members to manage their donations to your church, as well as create pledges and create Gift Aid Declarations. This can greatly improve the financial engagement of your church members, by making it as quick and easy as possible for them to manage their giving to your church. My Giving takes just a couple of minutes to activate on your account, so let's get started. Begin by going to the Giving module and clicking through to the Module Options page (the icon of the cog wheels in the upper right hand corner of the page). Click through to the My ChurchSuite tab. Under Settings, check the box marked "Enable My ChurchSuite access" and use the "Grant My Giving access to" drop down menu to determine whether access to My Giving will be given only to existing givers or to anyone with My ChurchSuite access. Selecting "Only existing contacts" will then give you the option to givers that are part of a particular tag in the Giving module. Simply use the "Restrict My Giving to givers tagged with" drop down menu to select the tags whose givers you wish to grant access to. Continuing with the other My ChurchSuite settings; to enable your church members to make pledges to your church's funds, check the box marked "Enable pledge management". To enable your church members to create Gift Aid Declarations (UK churches only) to cover their donations, check the box marked "Enable declaration management". Note: To comply with HMRC Gift Aid requirements, your My ChurchSuite users will only be able to add a new Gift Aid declaration if they have a valid UK address recorded in the My Details section of their profile. Note how you can add an optional custom message above the Pledges and Declaration Management sections. You might use these sections to give the contact details of your treasurer or finance department, or to link to additional resources you've made available regarding how your church stewards the donations they receive. Click to "Save Changes" before navigating away from the module settings.